All new teeth in just 24 hours this month! We can restore all of your teeth for you! Enjoy a full smile again with our excellent service! Chew comfortably without worrying about the heat or the cold! Smile and be happy without enduring the discomfort of dentures! Replace missing teeth with dental implants and fixed beautiful teeth in just 24 hours! Currently the most advanced All-on-4 technique helps to recover all teeth. Unlike removable plates or dentures, all the teeth fixed to the implants are stable, it is not necessary to remove them, and heat, cold and taste is felt exactly the same as with natural teeth. Besides, you will be able to eat hard food without worrying that dentures might fall out. This revolutionary, life-changing technology is the most suitable for toothless or those people with many hopeless teeth. What options can these people choose from? During the consultation, the overall jaw shape is evaluated and treatment is planned. If necessary, hopeless teeth and their roots are removed. Implants are screwed into during the same visit. Temporary aesthetic plastic denture for implant treatment period is made and placed within 24 hours, which can be used, if necessary, for 1-2 years. The price of the procedure – € 4500, the cheapest way from glum toothlessness to a happy life with real teeth and big smile! Sutures are removed after 7-10 days. Permanent prosthodontics procedure after 6-18 month with metal plastic or ceramic teeth. Success rate – even 97 percent. ​In most case, prolonged and painful bone augmentation procedures are not necessary. ​The procedure is well tolerated, it may be completed within 1.5-3 hours. ​The procedure can often be performed to patients with osteoporosis and diabetes, to whom bone accretion usually contraindicated. You will save up 40-50 percent of funds in comparison with conventional implants and bone accretion. A new set of real teeth for affordable price within 24 hours! Real teeth feeling and no discomfort! It was removed 12 damaged maxillary teeth, screwed 4 implants and after 24 hours fitted temporary denture during one visit. During one visit it was removed all of the maxillary teeth, screwed 4 implants and beared a temporary prosthesis. The result after 24 hours. The temporary dental prosthesis you’ve had installed within the the first 24 hours after implantation is made acrylic material and braided wire. 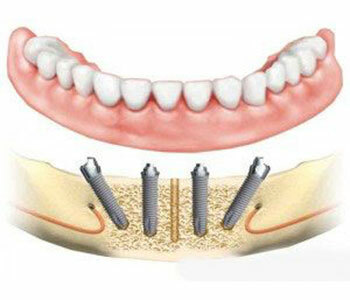 It is perfectly suited for the time that is necessary for the implant to take root. However, it would still be preferable if you moved on to a permanent one after the swelling of the mucosa has ceased and the gums have settled. The procedure is recommended within 4-6 months after the implantation. Modern prostheses are made of materials that are very sturdy and long-lasting. They also ensure normal chewing and look really aesthetically pleasing. This prosthesis has a long lifespan and is quite sturdy. Its main element is the metal frame which is not visible from the outside, as well as the acrylic teeth. Compared to the temporary prosthesis, this prosthesis is a much improved variant. It is built step-by-step in a laboratory. Practically any shape, color and size of teeth may be chosen. This prosthesis is made by finishing a metal frame with a ceramic layer. The color matches the natural color of the teeth. Such prostheses are very aesthetically pleasing, and they’re resistant to wear. They are also cheaper than zirconium ceramic prostheses, but do not let light through, which may look unnatural. The ceramic finish may also break and this prosthesis is much more difficult to repair than the acrylic one. It is used produced if there is less than 12mm of vertical space in the mouth. Metal-ceramic prostheses are manufactured in a laboratory, where the shapes, colors and sizes of natural teeth are reproduced precisely. This prosthesis is up to par in aesthetics and physical qualities with to zirconium ceramic. This prosthesis is very aesthetically pleasing and is made from zirconium oxide. It is milled using a computer milling machine. This results in a monolith frame. While making prosthetics for teeth, one of the most important criteria is aesthetics. Choosing a zirconium prosthesis ensures that your prosthetic teeth look really natural. In comparison to metal-ceramic, the zirconium prosthesis is of a white color and refracts light. If the prosthesis is fixed to an implant, it makes contact with the gums. This is why it is important to ensure that the material of the prosthesis is not allergenic. Zirconium ceramic is accepted by the body as a natural material, which means that the prosthesis does not cause any discomfort and it doesn’t leave any specific taste. Zirconium ceramic is a perfect fit for patients who are looking for long-lasting aesthetics and a sturdy build quality.